What is ginger garlic paste? Ginger and garlic are the two most important spices for cooking food. Ginger garlic paste is one of the essential ingredients used in Indian cuisine. It also serves as a carminative and gastric stimulant in many medicine preparations. Earlier, people used to prepare the ginger garlic paste at home. However, busier lifestyle and increasing disposable income have prompted the consumers to use ready-to-cook ginger garlic paste. 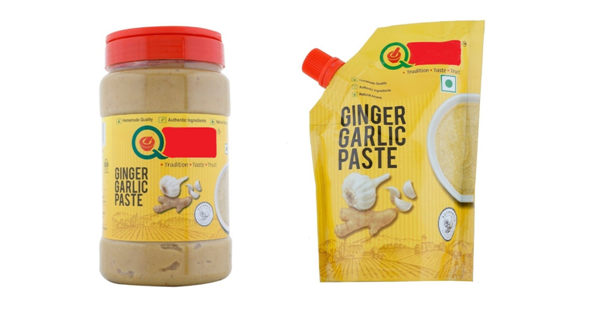 The ginger garlic paste is an FMCG item, which is getting immense popularity not only in the urban areas but also in small towns and rural areas. The cooking paste segment is catering to working professionals, students, travellers and chefs. With the changing purchase dynamics and the growing need for quality branded products, many food manufacturing companies have forayed into the cooking paste segment. How to make ginger garlic paste? 1. Procure raw materials – The food product development must ensure that all the procured raw ingredients meet the desired quality parameters. 2. Cleaning – Ginger and garlic should be thoroughly washed. 4. Crushing & Pulping – Use crushing machine to crush the de-skinned ginger and garlic. The crushed material is then put into a pulping machine to obtain a paste of uniform consistency. Add required quantity of turmeric, salt, water and remaining powder ingredients. 5. Adding Preservatives – Transfer the material into a stainless steel vessel and add preservative to it. This is done to enhance the shelf life of the finished product. 6. Packaging – The product is vacuum packed into pouches or other suitable packaging material. The paste is a semi-solid product. Hence, one would require a leak proof packaging. The ginger garlic paste can be vacuum packed in can, plastic container, re-sealable pouches and bottle. The ginger garlic paste is indispensable for Indian cooking and the fact that it saves time and energy for our ‘garb and go’ customer makes it a great buy.